Loan amount: Business loan rate in Syndicate Bank depends upon the loan amount you apply for. Higher the loan amount, lesser will be the interest rate. Bank gives loan of minimum Rs. 50,000 to upto Rs. 5 Lakh. Interest rate for high loan amount can be lower resulting in lower EMIs. CIBIL Score: Syndicate Bank offers loan at higher interest rate if your CIBIL score is low or vice versa. However, to get loan from Syndicate Bank, your CIBIL score should be atleast 700. Higher the CIBIL Score, higher the chances of getting a loan at lowest business loan interest. Revenue: Syndicate Bank will offer you loan at lower interest rate if you have higher monthly revenue. Bank gives loan to the borrowers whose annual turnover is at least Rs. 0 . Time in Business: Syndicate Bank offers loan at lower rates if you have significant business experience. Minimum business existence to get loan from Syndicate Bank is 0 months. Age: Age plays an important role to know your eligibility and repayment capacity. Syndicate Bank offers loan to those who are at least 21 years old at the time of loan approval and maximum 58 years at the time of loan maturity. Loan Amount: Based on the loan amount eligibility, bank gives you loan ranging from Rs. 50,000 to Rs. 5 Lakh. To improve chances of approval, apply for a loan amount that you can comfortably service. Profitability and Revenue: Loan eligibility significantly depends upon profitability on your turnover, revenue and profitability. Syndicate Bank requires profit for minimum 2 years and minimum business turnover of Rs. 0 .
Business Stability: Future business prospects and its stability is important to improve your eligibility for business loan. Syndicate Bank requires minimum business track record of 0 months. The bank will also look for minimum growth in sales for the last three year. A decline in sales for a certain period or below a certain limit might impact your eligibility to get loan. ITR and Banking: Bank gives loan only after checking your income tax return and bank statements. Your ITR details for minimum 0 months and bank statement for minimum 0 months will be required by Syndicate Bank. CIBIL Score: When checking loan eligibility, Syndicate Bank will look at the complete CIBIL report. Syndicate Bank will check your repayment history for all current and past loans and credit cards. Bank advise you to maintain a score of 750 and above to get loan approval. Interest Rate: Higher the interest rate, higher will be the EMI. For a 60 months loan from Syndicate Bank at an interest rate of 12.65% per annum, EMI will be Rs. 2,257 per Rs. one lakh loan amount. At an interest rate of 13.65% for the same loan, the EMI will be Rs. 2,309 . Loan tenure: Longer the loan tenure, lesser your smonthly EMI. At interest rate of 12.65% per annum, the EMI on Syndicate Bank business loan would range from Rs. 8,915 to Rs. 2,257 for loan tenure ranging from 12 to 60 months. Amount Borrowed: Syndicate Bank Loan EMI will be high if you apply for a high loan amount. For amount borrowed Rs. 50,000 , the EMI at 12.65% for 60 months would be Rs. 1,129 . Similarly for amount borrowed Rs. 5 Lakh, the EMI at 12.65% for 60 months would be Rs. 11,287 . Why to take business loan from Syndicate Bank ? Bank offers loan at 12.65% rate with the lowest EMI of Rs. 2,257 per lakh. If you are paying EMI more than this then you can opt for balance transfer and relocate your loan to Syndicate Bank. What is the interest charged on Syndicate Bank business loan? Interest rates on Business loan in Syndicate Bank are very attractive starting from 12.65% to 13.65%. Bank offer various offer for self employed professionals to get loan at very low rate of interest. What is the lowest EMI per lakh on business loan from Syndicate Bank ? If you apply for loan from Syndicate Bank, your lowest EMI per lakh will be Rs. 2,257 . What is the minimum and maximum tenure of business loan in Syndicate Bank? 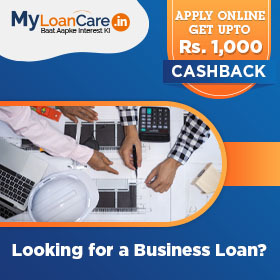 How much business loan amount I can borrow from Syndicate Bank? Syndicate Bank offers you loan if you need a minimum amount of Rs. 50,000 to a maximum amount of 5 Lakh. What is the processing fee charged by Syndicate Bank on business loan? Syndicate Bank charges a processing fee of 0.5%, Min Rs. 500 with applicable tax. Is age an eligibility factor to get loan for business from Syndicate Bank ? Yes, age is an important eligibility factor to get loan as you should be at least 21 years old at loan approval time and 58 years old at loan maturity time. What are the prepayment charges on business loan from Syndicate Bank? Bank charges a fee in case you want to repay your entire loan amount before the end of tenure period. The fee charged by Syndicate Bank is Nil prepayment charges . In a bid to offer comprehensive financial planning to its customers, Syndicate Bank and SBI Life Insurance have signed a bancassurance pact. With this arrangement, the two banks are likely to further improve their presence across the country by offering different insurance products, wealth creation as well as savings insurance products to its customers. Syndicate Bank has recently launched a home loan and MSME campaign in Kolkata at its bank branch located at Rajarhat. The campaign is organized to bring awareness to the general public about various products including housing loan, education loan, Vehicle loan, Gold loan and Business loan. Syndicate Bank is planning to focus on improving its asset quality in FY18. Simultaneously, the bank aims to bring down gross non-performing assets (NPAs) to 8.75 per cent. Besides improving its asset quality, the bank would also focus on mobilising its CASA deposits and growing its advances to the retail, agriculture and MSME sectors. In a bid to reduce the loan processing time and also to smoothen the entire loan sanction process, Syndicate Bank has established a dedicated Retail and MSME Loan Centre (RMLC) in the city, Hyderabad. The newly launched centre will act as a hub and will provide assistance regarding loans. Telangana State Industrial Infrastructure Corporation (TSIIC) has announced its tie up with Syndicate Bank to extend loans for executing projects and establishing industrial parks in the state. Under the arrangement, financial aid will also be extended to companies and industrialists setting up facilities through TSIIC.